Click here to read the previous post, or you can start from the beginning. 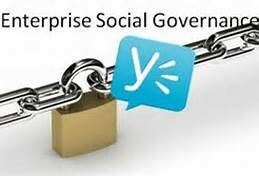 There’s no argument that governance is a critical component of any successful Enterprise Social deployment; but the truth is, most implementations begin with little to no governance. Why’s that? Because this promising method of collaboration and communication will not be stuffed into the tight box of control and comply. As a result, there’s broad uncertainty about how best to construct effective policies. Make no mistake, an old school, IT-oriented approach to governing will fail. Here’s why. One clear source of value-creation from Enterprise Social is the unmitigated openness of the platform. This inherent capability flattens an organization, spurring communications across the entity without regard to conventional hierarchies. Any governance methodologies that constrict this openness is counter-intuitive, resulting in diminished value. Other significant challenges for governance exist as well. The top three, based on a 2013 Collaboration Benchmark Study commissioned by ViewDo Labs, are; managing security and permissions, visibility across all tools, and driving user adoption. With the complexities in mind, let’s consider how to build policies that empower instead of negate. To begin, awareness of and adherence to specific guidelines, regulations and laws applicable to your region, state, and country are paramount. Specifically, those regarding the collection of data and the newer ones relevant to social media in particular. Right now, numerous government bodies and regulators; including the National Labor Relations Board, the Financial Industry Regulatory Authority, the Federal Trade Commission and others, are revising guidelines and regulations regarding Social Media. Changes are ongoing, so be aware and work to align your internal policies with those applicable.Also, consider Enterprise Social networks as an expansion (if not an imminent replacement) of email and phone. As such, extending many of the guidelines in place for these modalities is an appropriate choice. Common elements of email policies cover best practices, prohibited content, integrity considerations and more. So it’s easy to see how these can also apply to Enterprise Social. Another similarity, information associated with internal social networks is classified as Electronically Stored Information (ESI). Which means, it must be discoverable. The point is to sensibly adapt current policies where you can. 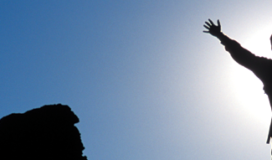 Create a comprehensive framework for governance. 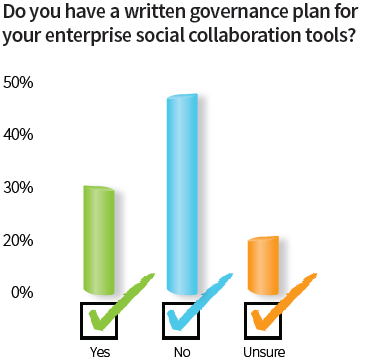 The concept of governance can be unwieldy, especially when applied to Enterprise Social. That’s because the volume of moving parts is daunting, so start with clarity around what areas require policies. Essentially, there are four; people, processes, technology and data. For each area, you’ll need to craft specific governance strategies. Consider only what’s absolutely necessary; unwarranted constraints can defer the creation of positive business outcomes. Tasks may include; incenting behaviors and defining usage, integrating workflows and creating access schemes, content creation and the like.Let’s look at the people portion of the equation. Here’s where we intend to define 1) the common interest and 2) the rules of engagement. The chart below offers potential components of a strong, comprehensive set of people policies, as well as the expected value of each. The General Policy Statement should closely align with the organization’s stated business conduct guidelines; with integrity, respect and privacy as dominant themes. The additional guidelines offer a roadmap for successful engagement. They provide details around the creation of trust, define what mutual value is all about and enable self-guided behaviors. Since Enterprise Social is squarely about people, this set of guidelines may be the most crucial. Policy around the other segments; processes, technology and data are (potentially) easier to develop and refine. Be forward-thinking about who owns what. IT or Business. When it comes to technology and data, the decision is clear. These are owned and operated by IT. It’s what they do and they’re good at it. But business stakeholders need a few seats at the table. While we expect that BDM’s helped select the technology, they should also have input in terms of access control and process. The people part of those. IT governs tools. Business governs people. Bottom line is, governance should be less about control and more about guidance and leadership. As explained in a previous post, Uncover. Align. Adopt. Refine…with Enterprise Social Analytics, trust between individuals is a vital component of a successful internal social deployment. Command and control does not promote trust.Here’s my final point, becoming a social business is not a reactive process. Be prudent, be adaptive, but drop the fear! Create simple, clear guidelines and processes. And be sure to inject some well-developed training to teach employees how to fully engage, while remaining compliant to internal and external regulations.